Do you have a story idea? Email us! We'd love to hear. 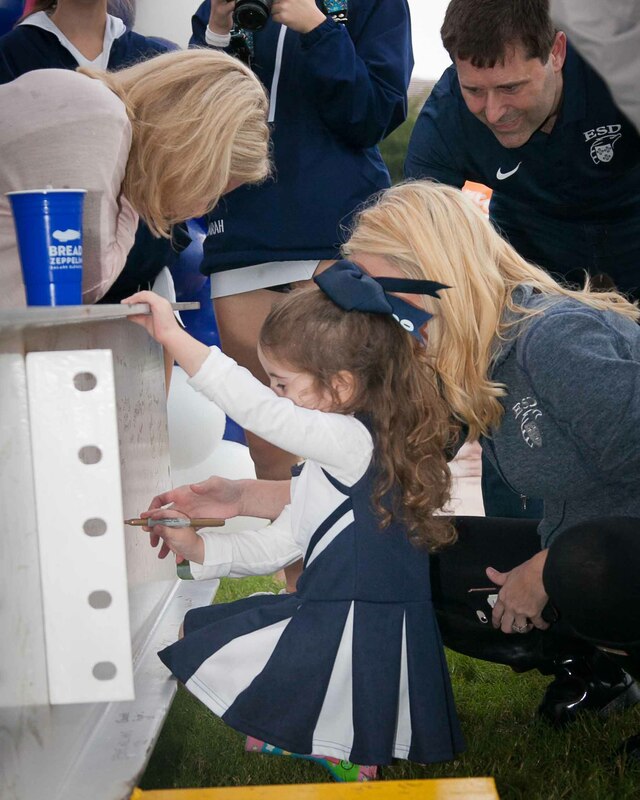 Many thanks to the many Lower School community members who came out to sign an actual beam for the new Lower School. The evening began in Jones Family Stadium cheering on varsity field hockey and continued to outside the construction site where families, teachers, and Eagles made their mark on a specially painted beam. Families and teachers enjoyed dinner in the Pavilion made possible by the Dads’ Partnership and gained a bird’s-eye view of the construction site from the third floor of the Stephen B. Swann Athletic and Wellness Center. Varsity volleyball and varsity football were also in action, and the enthusiasm of our littlest eagles and their families undoubtedly helped lift the teams to victory. The signed beam will soon be placed and serve as an essential beam in the new building's roof structure. While not visible, a permanent plaque on the wall will denote its location for generations to come. The winners of the third-floor guessing games will be contacted by Jamie Mitcham Longbotham. Thank you to all who participated and to the Eagle’s Nest for providing the prizes! The feathers represented the 2,765 cubic yards of foundation poured for the first-floor slab. The pompom balls represented the 587 tons of structural steel. The paint brushes represented the 110 tons that the biggest onsite crane can lift.